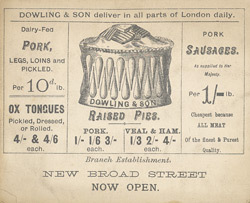 This is an advertisement for Dowling and Son, pork butchers. Victorian butchers shops opened right onto the street so that customer’s could see that quality of the meat for themselves. The walls and doors were often ornately decorated with images of pigs, cows and sheep painted on beautiful tiles and the owners name would have been painted in bold letters on a sign above the shop. The meat was arranged on trays with small signs indicating the price of each cut. Wealthy customers would have had fresh meat delivered to their houses once or twice a week.